Moveable Feast: Dinner is served. As a matter of fact, dinner is almost done for the eggs embedded with great accuracy and intention by the mother wasp into this otherwise invisible garden pest–the tomato (also called the tobacco) horn worm. See the horn up top? She found and then injected the host caterpillar many times with her hypodermic ovipositor (at least as many times as you see white cocoons of eggs-turned-to-pupae). 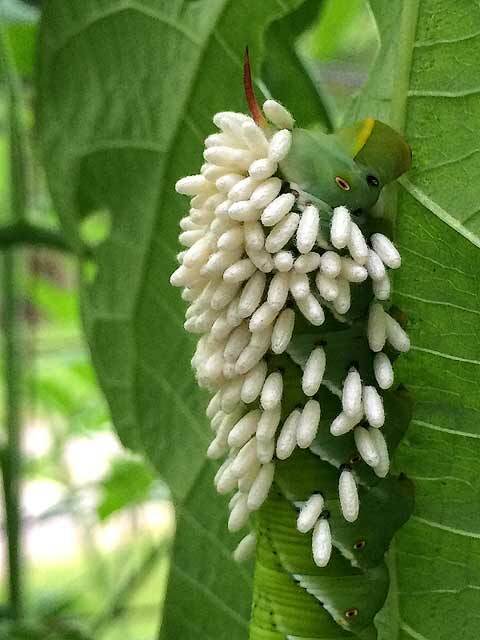 Those eggs have hatched, turned to tiny larvae who have eaten caterpillar juices and tissues, and emerged to the exterior to spin an external cottony capsule attached temporarily to the host. Each of these wasp pupae will fall to the ground, hatch this season or next year into more tiny braconid wasps, who will patrol my garden for more tomato horn worms. They can find them before they do too much damage. The human eye, not so much. I mean, lookit: Compare the color to the tomato leaves in the background. BAM! A perfect match. Compare the striations and diagonal lines on the caterpillar to those of the veins of the tomato leaves: BAM! Remarkable! Horrifying! This sucker, got to hand it to him, is a marvel of camouflage, so I am indebted to the chemical tracking (I suppose) that makes easier wasp targets of such as this that would defoliate our ‘maters in no time at all. Oooooh! What an ugly critter!!!! That caterpillar camouflage is awesome. No way can the human eye see it on a leaf. Wasp reproduction story amazing, too. Fred: I have been told that one can use a portable Blacklight at night and these worms will glow and be made easy to see in spite of their natural protection. I didn’t worry so much about the foliage they ate, that only served to alert me to their presence at which time, I searched for them anytime I was working around the vines. It was the damage they did to the tomatoes I hated. I got good at spotting them when I really focused. I did appreciate those tiny wasps and the damage they did which helped me even if they didn’t realize it. Those white cocoons made it so easy to find and pick them off.